Notes: Opening act for Deep Purple and Bad Company on the former's House of Blue Light tour. This show is completely unconfirmed. During this time, Queensrÿche was likely in a Philadelphia recording studio doing some pre-production for Operation: Mindcrime. Because of that, it is theoretically possible that they could have been added to the bill on this show in support of Deep Purple and Bad Company. I cannot confirm this, however. That said, keep in mind that during this period, the band was between management and booking agents, and Chris DeGarmo was doing the booking for Queensrÿche. So it is certainly a possibility he could have booked an "escape from the studio" gig for the band. 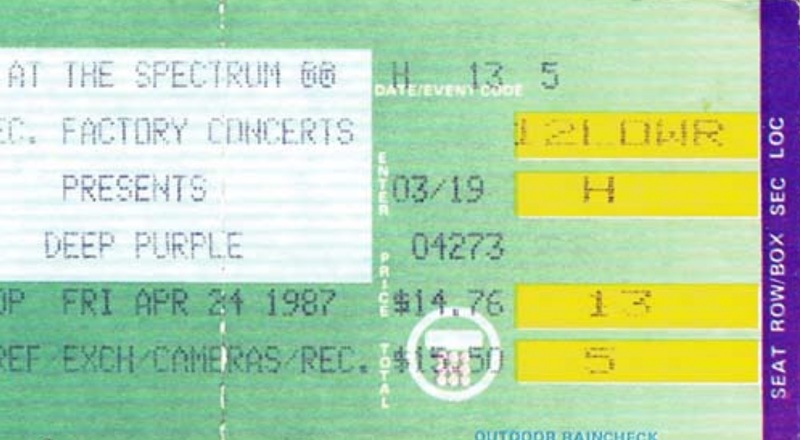 The trigger point for adding this date was discovering a ticket stub on eBay, which has Deep Purple on it. But the seller listed it as Deep Purple/Bad Company/Queensryche. After being contacted, the seller said he got that info from setlist.fm. While setlisf.fm is not very accurate, given the info on Queensryche's location at the time, I do find the date to be likely. Unfortunately, after contacting Dirk at the Deep Purple Tour Page (a site much like this one), he had no other information, but is looking for confirmation. The above ticket stubs are from Dirk's site.